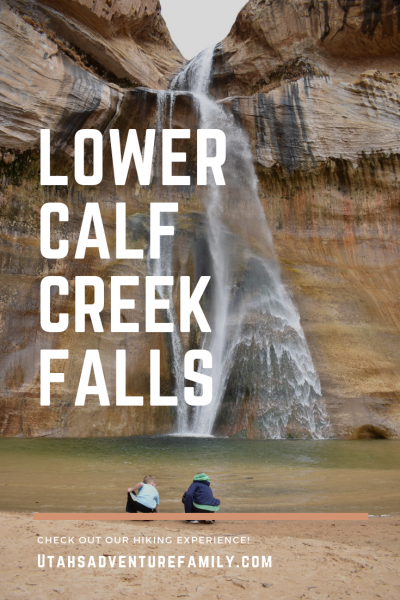 We’ve had Lower Calf Creek Falls on our bucket list for more than a few years. We haven’t ever made the attempt, though, because they overall distance is a little daunting at six miles. But this year our youngest turned six, and it seemed like we might be able to achieve this distance. Tips: Limited shade, so take plenty of water and wear sunscreen. Hike in mornings or evenings. Be prepared for crowds. 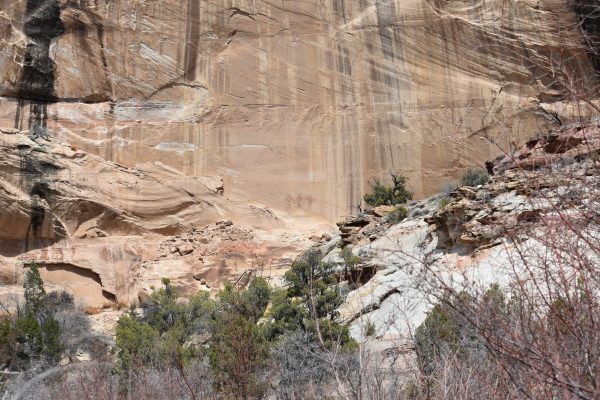 As it turned out, Lower Calf Creek Falls was quite doable. The hike is primarily flat, though you are gently climbing alongside the river all the way to the waterfall. There are a few short up and down sections, but elevation change was not a problem. The trail is easy, but long! 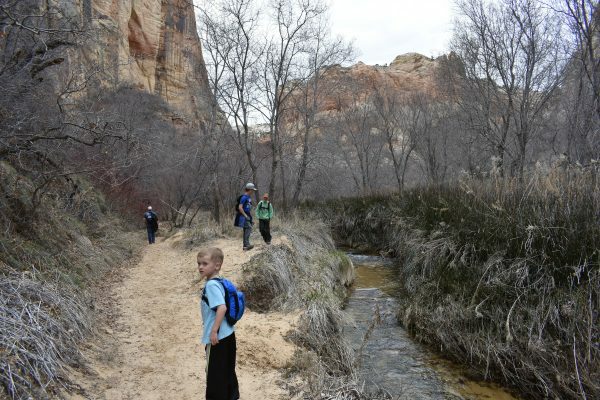 We hiked Lower Calf Creek in March, and the high temperature was only about 55 degrees. This proved to be lucky, because there is not a lot of shade on the hike. 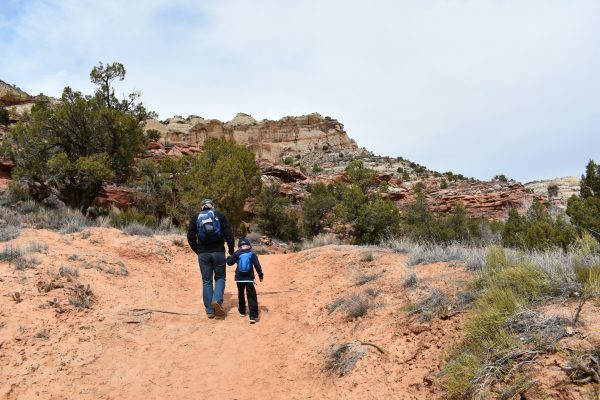 Make sure to use hats, sunscreen, and lots of water as you hike, because summer is scorching hot in this part of the state. Probably the most difficult part of this hike will be finding a parking spot. There are only a few dozen in the small parking lot. We waited for about fifteen minutes near the bathrooms for someone to drive away, and it was not even the busy season. 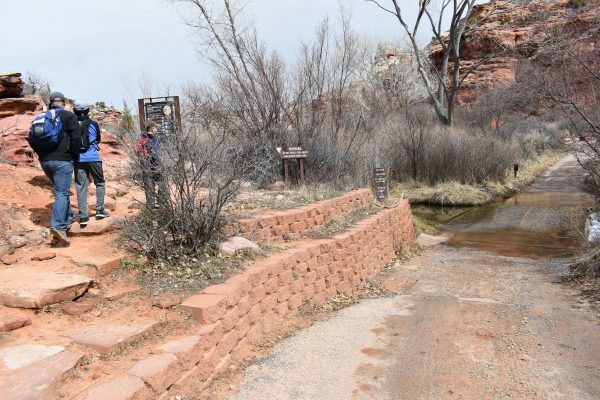 There is also a campground at Lower Calf Creek Falls, so the area can be quite busy. 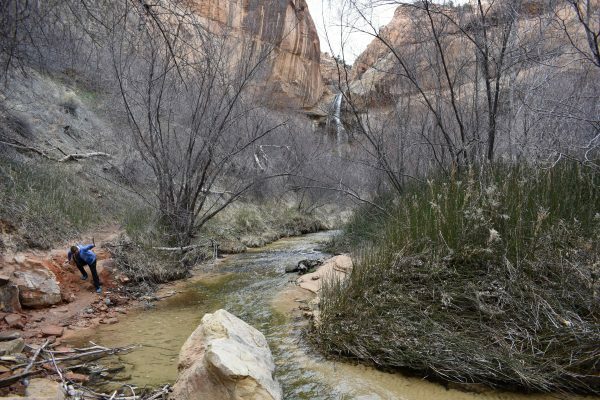 Lower Calf Creek Falls is beautiful. From the bathrooms, head to the far end of the parking lot. The trail starts out on the campground road for about a hundred yards before the trailhead appears on the left. Make sure to pick up a trail guide and sign in at the register box. Along the trail are numbered markers, and the trail guide gives information about each marker. 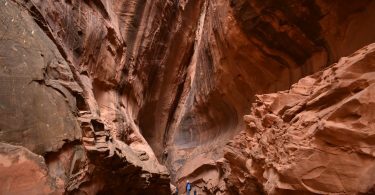 Most interesting were the petroglyphs and Anasazi graneries on the canyon walls. The trail begins here after walking down the campground road for a bit. Make sure to pick up a trail guide. 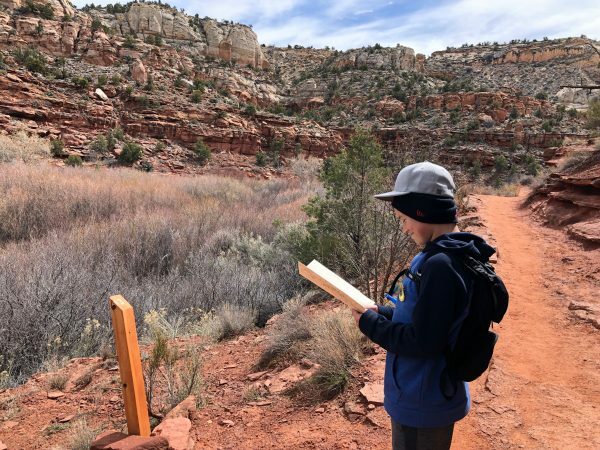 These numbered posts offer automatic breaks along the trail as your read about the landscape and area. There are petroglyphs along some of the walls, and old granaries. 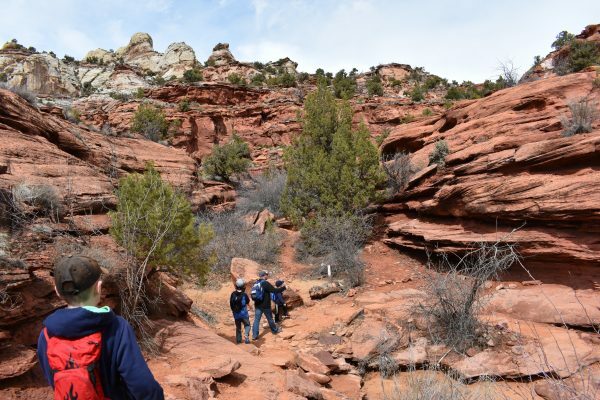 The trail crosses some rocky areas, but mostly it is sandy. It is quite pleasant with the creek gurgling along beside you. Our boys enjoyed spotting fish in the shallow water. 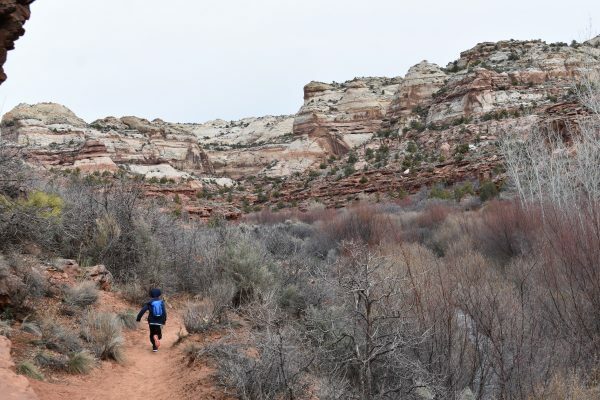 The trail has been so well-traveled, even in March, that it is impossible to get lost. We passed dozens of people along the trail, and, as stated, we were hiking in the offseason. Most of the trail is sand. In the Spring it was packed nicely, but in the summer it might be trickier to walk in. There are a few spots with slick rock to hike on, but not many. 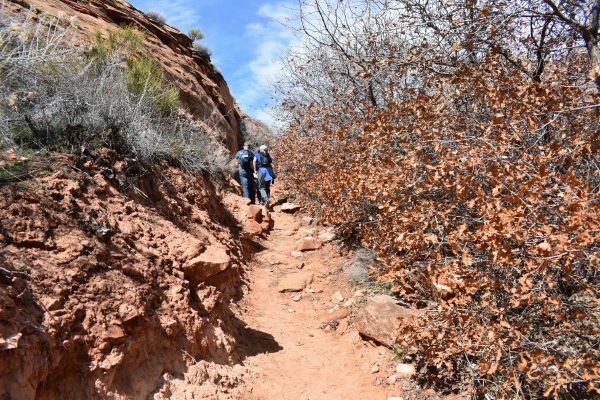 There are only a few times where the trail has a little bit of a climb. Most are short and nothing is very steep. Finally, the falls come into view. 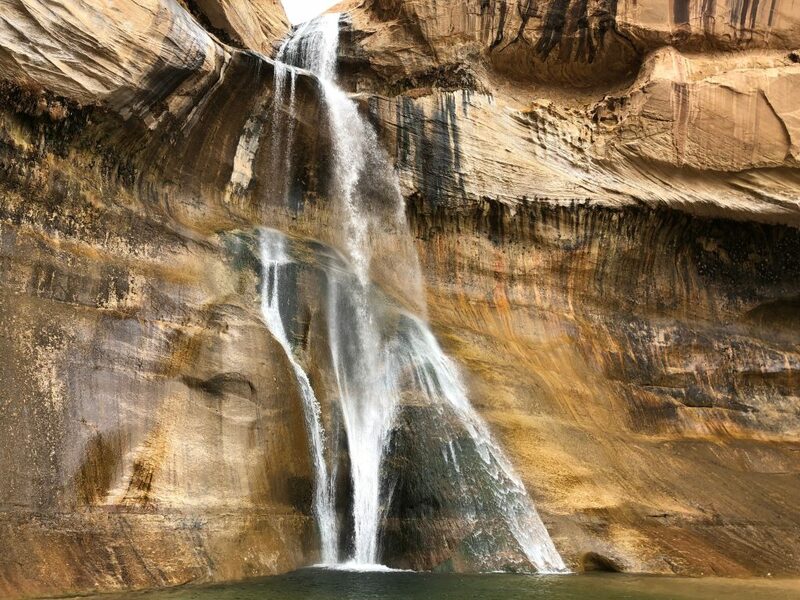 Lower Calf Creek Falls is 126 feet from top to bottom and there is a deep pool at the foot of the cliff. Some people wade or even swim, but it wasn’t the right time of year for us to get in the water. Best of all, there is a wide sandy beach that almost seems like a viewing amphitheater for the falls. 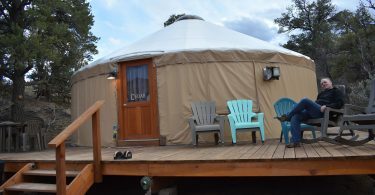 Plenty of visitors can get a good look at the water, no matter how many people are visiting. 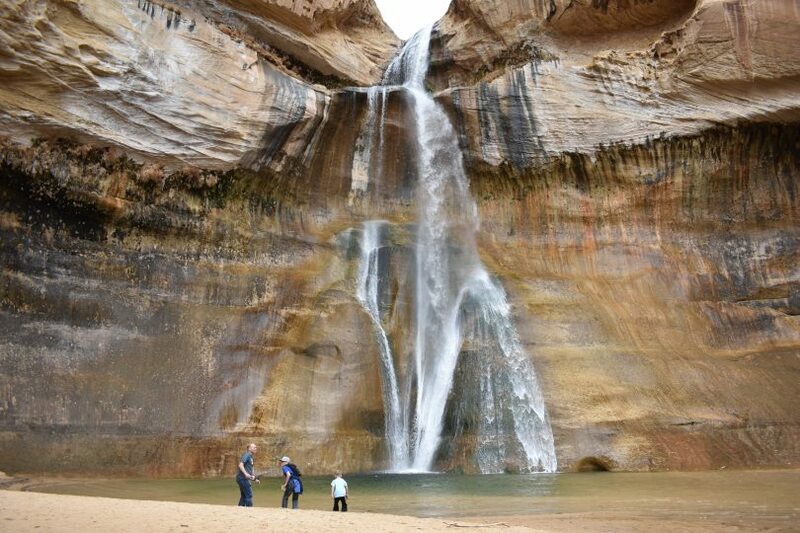 It is one of the most gorgeous waterfalls Utah has to offer. Once you start walking really close to the creek you know you are close to the waterfall. When the waterfall appears, you will want to run the last little bit of the trail. 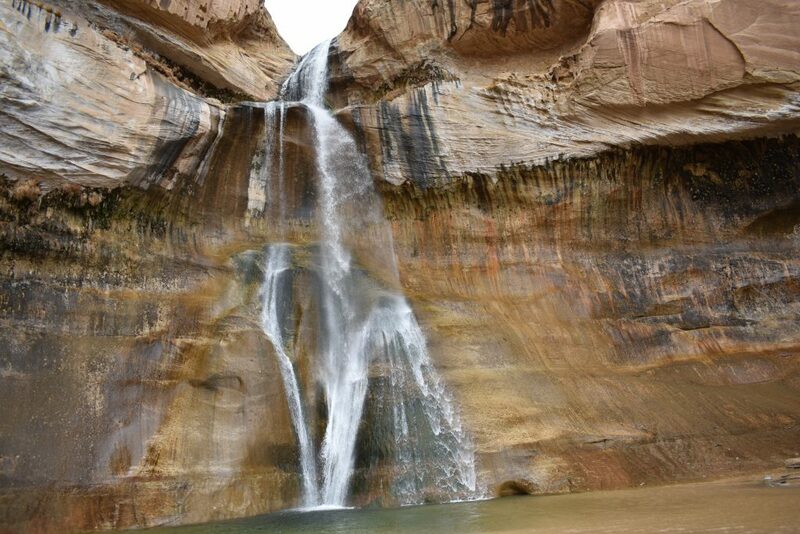 Lower Calf Creek Fall is a stunning waterfall. The hike back to the car is not as difficult as the hike in. It is very slightly downhill, and we made it in about 30 minutes less than the hike in. Our total roundtrip time was just under four hours with our six year-old. 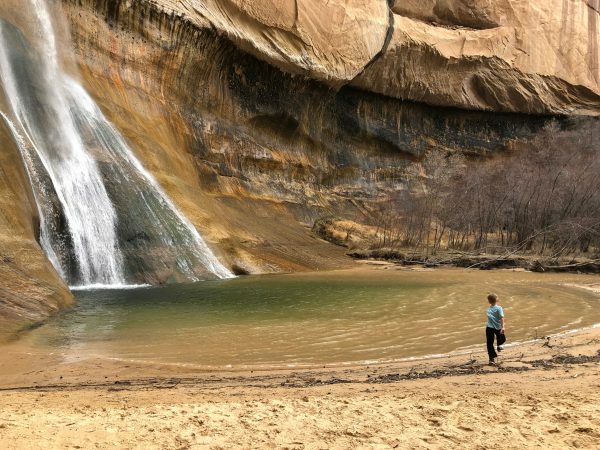 It was definitely worth the trip to Lower Calf Creek Falls. Give it a try if your family is out of the toddler stage. 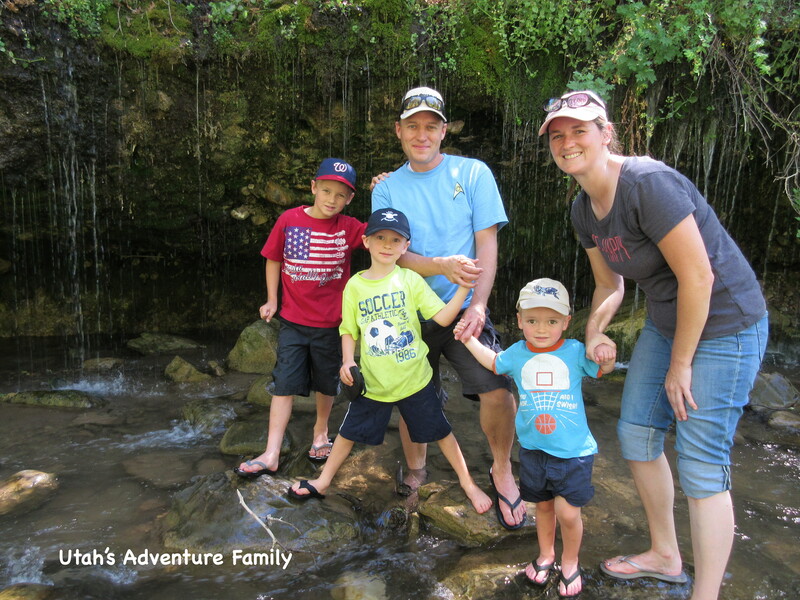 In the summer, you will definitely want to cool off in this pool at the bottom of Lower Calf Creek Falls. I went there on a field trip in high school and decided to bring my fishing pole. The creek is full of brown trout that were going crazy for a little gold spinner. I think not a lot of people fish there because I was catching them almost every cast. There’s a sign there saying there’s high mercury levels in the fish so they wouldn’t be good to eat, but catch and release is still really fun. Thanks for the tip about fishing!